I haven’t eaten much McDonald’s food since I became a vegetarian over 12 years ago, but I must confess I can’t say the same about their drinks. Especially the cold, caffeine-laced ones. But it’s not just McDonald’s – I love me an iced coffee from anywhere, really. Last summer I even coined the term “Frappucino Fridays” to get my co-workers to come along for the ride (and allay my guilt at spending $5 on a drink). Coffee. Photo by Mike D.
This year is different. I still find it hard to resist the sugary, slushy beverages, but I know I must. The more I drink them the more I want them – that’s the way with anything that delivers up to 500 liquid calories per order, most of it from sugar. Yes, up to 500 calories. And they go down easier than water on a hot day. For a while I willfully deceived myself into believing there’s nothing wrong with adding a bit of sugar and milk to my coffee. There are worse things, right? Well it turns out only one of these three major chains’ cold coffee drinks are that simple – so even if you add sugar, it’s still better to make iced coffee at home (more on that later). Check out these abominations of iced coffee from McDonald’s, Starbuck, and Tim Hortons. And keep in mind that black coffee is basically calorie-free. Iced coffee (small): 160 calories with 22 grams of sugar (from liquid sugar that includes potassium sorbate as a preservative) and “light cream” (containing milk, cream, sodium phosphate, DATEM [what the heck is DATEM? ], sodium stearoyl lactylate, sodium citrate, carrageenan). More telling, there are over 40 different ingredients if you go with the default whipped cream, chips, and caramel/chocolate drizzles. These include artificial colours (Red 40, Yellow 5, Blue 1), artificial flavours (vanillin, ethyl vanillin), high fructose corn syrup, hydrogenated coconut oil, preservatives (potassium sorbate etc.) and “whipping propellant (nitrous oxide – that’s certainly not the way I whip cream in my kitchen!) Most telling is the only coffee in this beverage is “coffee extract” in the mocha coffee frappe base. Starbucks doesn’t list beverage ingredients online. For you non-Starbucks types, “tall” is their smallest size and it’s 12 oz. (375 ml). Mocha Cookie Crumble Frappuccino® (tall): This “coffee blended with mocha sauce, vanilla syrup, chocolaty chips, milk and ice, and topped with chocolaty whipped cream and chocolate cookie crumbles” packs in 340 calories and 48 grams of sugars. A non-flavoured Frappuccino has 36 grams of sugars; about 144 calories worth. Iced coffee (tall): The nutritional facts for this drink are 60 calories and 15 grams of sugar (about 4 tsp.). All signs point to this drink being truly just coffee, ice, and sugar. You can also order with no sweetener and add your own milk (if you want), making this the only true “iced coffee” on this list. 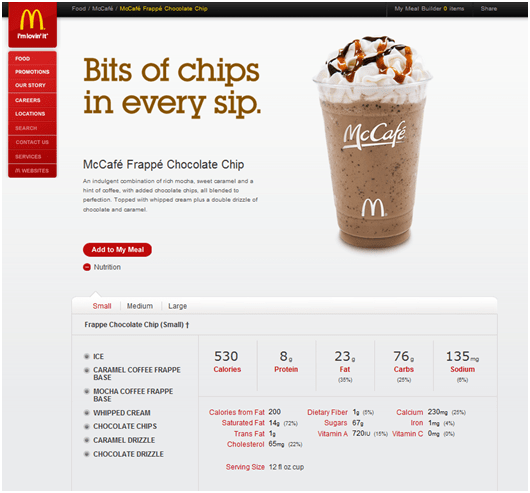 Tim Hortons also doesn’t list its beverage ingredients online. Iced coffee (small): “It’s our premium blend coffee, chilled and served over ice.” At 70 calories per small, I would almost believe it…except that their website lists “beverage base” as an ingredient. Glucose-fructose, sugar, water, sweetened condensed skimmed milk, salt, natural & artificial vanilla flavour, disodium phosphate, potassium sorbate, carrageen. Definitely not just milk here. Iced cappuccino (small): If you’re any kind of coffee aficionado, you’ll know this is not simply a cappuccino over ice. It has 33 grams of sugar but only 2 grams of protein, meaning only a little bit of that is milk and a lot has to be sugar or something else. UPDATE (2014): The “Iced Cappuccino Mix” ingredients have been added to this ingredient list PDF: Water, sugar, coffee extract, caramel colour, natural & artificial flavour. If you must go for an “Iced capp” at least order with milk instead of cream – you’ll be avoiding a further laundry list of artificial ingredients. 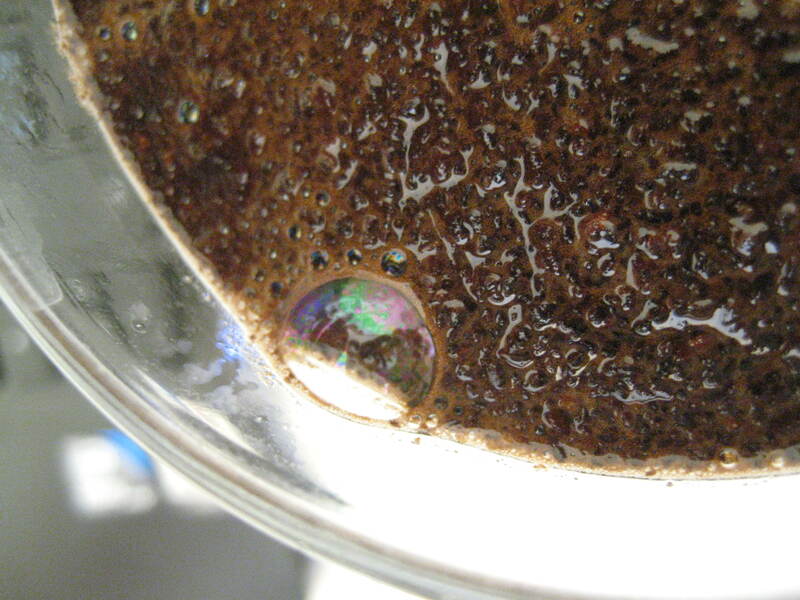 How do you avoid the minefield of slushy coffee drinks when you just need some cooled-off caffeine on a hot day? Learn to appreciate the natural flavours of coffee. I’m working on liking mine black…which is easier said than done, obviously. 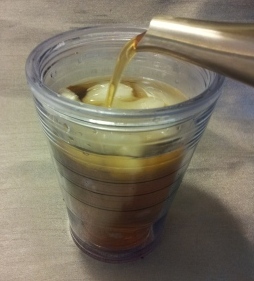 Make your own iced coffee at home. When I asked what was in that, she actually brought the container over, and after reading the disgusting ingredient list, told her I didn’t want that. She then gave me just what I wanted all along, coffee with cream and lots of ice cubes, which I sweetened myself with stevia. It was delicious and refreshing. Thanks for posting the ingredients, I will be sharing this! It’s good to know you CAN actually get a real “iced coffee” at Tim Hortons if you know what to ask for!